Maybe your business is new. Maybe everyone who visits your website converts and your agents or sales team closes every lead. If that’s the case, you can improve your business simply by reaching more customers. This might be the size of an entire network: like how many users are on Facebook. But it’s probably better to narrow it down more: How many users on Facebook are located in our town or are in our age demographic or said “condo” this week? It also might be the size of a conversation. How many people on Twitter use our town hashtag (if you have a town hashtag). Or people who talk about a topic relevant to our business. 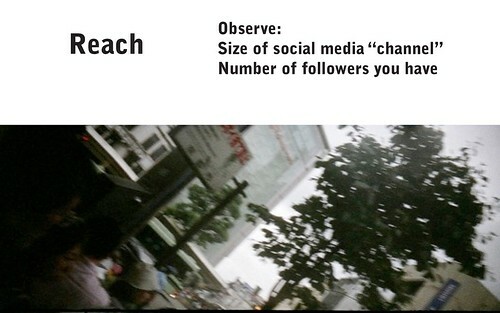 You can also measure your own reach: how many followers do you have. This number usually isn’t super helpful. I hope all of you can wake up in the morning and say “I don’t care how many Twitter followers I have” and instead focus on observing and then making things people like.